The result of 10 years of pioneering mobile, Galaxy S10e, S10, and S10+ introduce the next generation of mobile innovation. Redesigned to help remove interruptions from your view. No notch, no distractions. Precise laser cutting, on-screen security*, and a Dynamic AMOLED that's easy on the eyes make the Infinity-O Display our most innovative Galaxy screen yet. 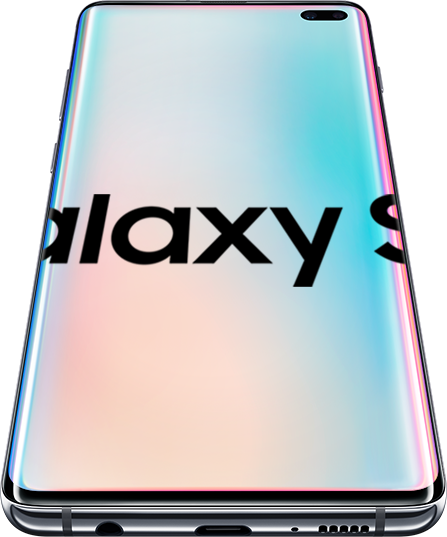 *In-display ultrasonic fingerprint sensor supported on Galaxy S10 and S10+ only. Not available on S10e. Simply touch the glass to unlock*. We've moved security from the back of the phone to the front, embedding the Ultrasonic Fingerprint sensor directly into the screen*. Capture the wider world. Use the panoramic ultrawide lens to take stunning, cinematic photos with a 123 degree field of vision. *Compatible with devices that support WPC Qi wireless charging (click here for details). Requires at least 30% battery life on Galaxy S10. A total game changer. We've engineered both hardware and software to give you performance-enhanced gaming. *Product colours may vary depend on carrier. Ceramic version only available on 8GB/512GB and 12GB/1TB Galaxy S10+ models. Based on results from Samsung lab tests, Galaxy S10 series may be charged up to 27-36% faster wirelessly than Galaxy S9. Charging time varies depending on the specific model (Galaxy S10e, S10, and S10+). Only available with Wireless Charger Duo Pad. Sold separately. Actual charging speed may also vary depending on the actual usage, charging conditions, and other factors. Fast Wireless Charging 2.0 only available with Samsung devices that support 10W+ wireless charging, such as the left pad on the Wireless Charger Duo Pad. Wireless charger requires power connection; please use the included original Samsung brand power cord and Travel Adapter. Use of third party items may cause damage to the Wireless Charger Duo Pad or a decrease in charging speed.